Coconut cream pie, for me, is one of those desserts that always elicit the most nostalgic childhood memories. As a young kid, it was always the dessert I gravitated towards before I discovered more gourmet options like crème brulee and bread pudding and became a bonafide dessert snob. Now, as an adult those “other” options have sort of lost their luster and I find myself pining over a coconut cream pie more often than any other dessert. Unfortunately for me, the restaurant which served my go-to coconut cream pie as a kid, the only one I’d even consider inhaling, closed a little under ten years ago, so I’m not able to actually recreate the original scene of the crime and pretend I’m a kid again. Fortunately for me, the pie lives on at local grocery stores around the Kansas City metro area, so while I can’t replicate the exact order of events and memories, I can still enjoy the exact same pie in the comfort of my home. It’s a blessing and curse all at the same time. I’ve toyed around with completely different versions of the tried and true coconut cream pie, because trying to replicate the recipe myself would just land me in severe disappointment. I’ll never be able to duplicate the perfectly flaky, buttery crust, or tint the garnish of coconut a perfectly pink hue, and I’ll never ever be able to imitate the most light as air, sweet whipped cream topping. I’ve been craving coconut cream pie and moist cupcakes almost daily for the last couple of weeks, so I decided that combining the two cravings was the logical next step. 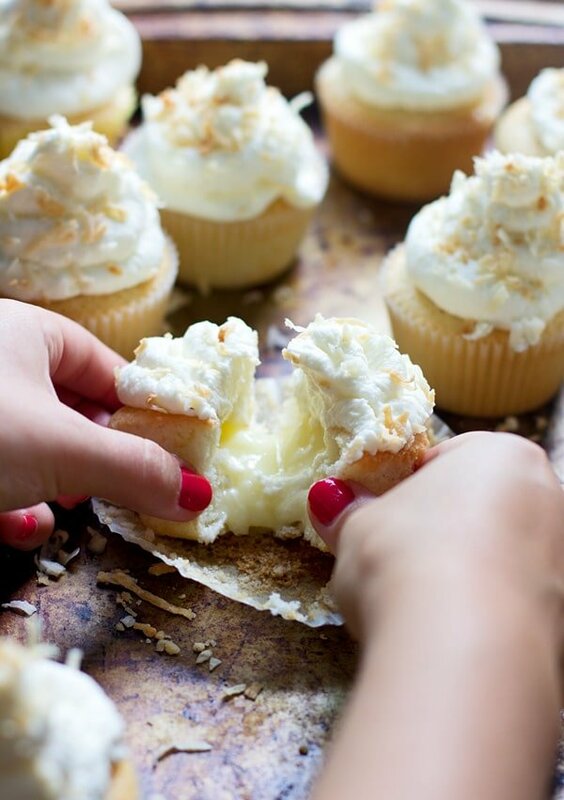 Logic paid off, because Coconut Cream Pie Cupcakes are my new favorite dessert. 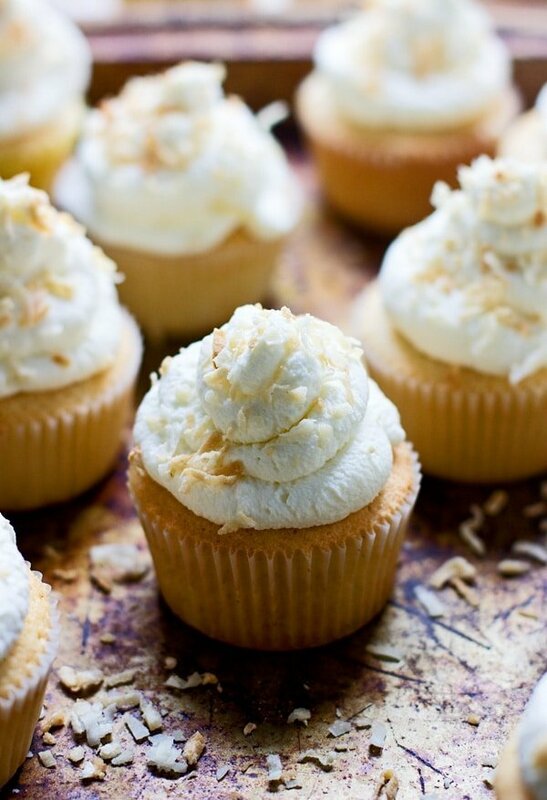 Light as air almond and vanilla flavored cupcakes are hollowed out and stuffed with a rich coconut cream custard, piped with a sweet whipped cream and mascarpone topping and then sprinkled with extra coconut. What results just may be the most perfect dessert hybrid known to man. I will not lie to you. This recipe is intense. There are steps. It takes time. And patience. And a little bit of skill. But if you follow the directions precisely, you shouldn’t have a problem. We begin with a simple cupcake recipe, an adaptation of this cupcake, which is an adaptation of a classic Martha Stewart recipe. Of course, butter and sugar make up the base of the cake, but vanilla almond milk, a whole vanilla bean and almond extract transform the coconut-based flavor into something completely different – in a good way. I really wanted to keep the cupcake itself free of coconut flavor so we could have the same “layers” of flavor as a classic coconut cream pie – the crust, the filling and the whipped cream topping. Two egg yolks give the batter richness, while four whipped eggs whites offer the cake a super light texture. Again, whipping up the egg yolks may seem like a task, but it makes a world of difference in the final product. The filling couldn’t be simpler – coconut milk, sugar and one egg yolk are heated up until slightly thickened and then combined with a cornstarch slurry which is just a mixture of cornstarch and almond milk. The cornstarch helps to thicken the custard so we don’t have to add more eggs. Once the mixture is thickened, a half-cup of coconut is stirred in and then set aside to chill. I get rather impatient when I’m required to chill things, so I transferred the mixture to another smaller bowl and stuck it in the freezer to speed up the process. I just stirred it every five minutes or so until it was cool. The last layer is a mixture of heavy cream and mascarpone. I was going to go with a whipped cream topping, but I don’t find them to be sturdy enough to actually pipe onto a cupcake. Softened mascarpone cheese adds a little bit of richness, but also allows the piping to keep its shape. 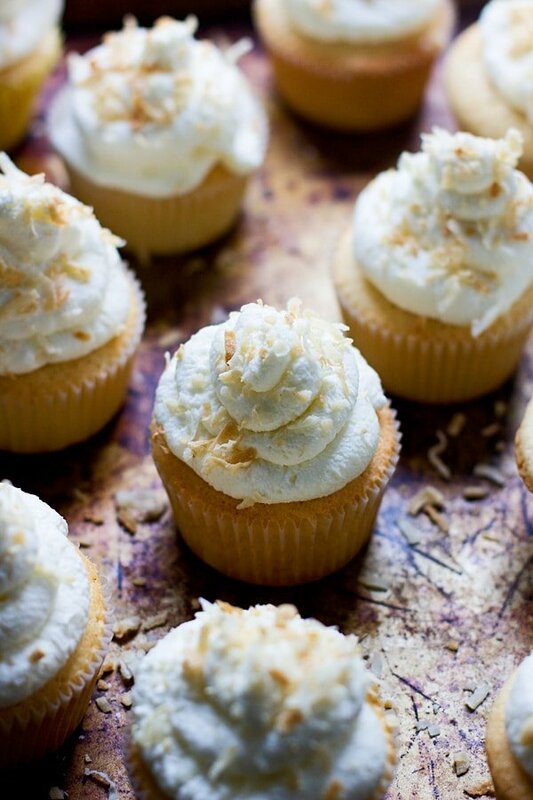 A sprinkle of coconut finishes the cupcake off. 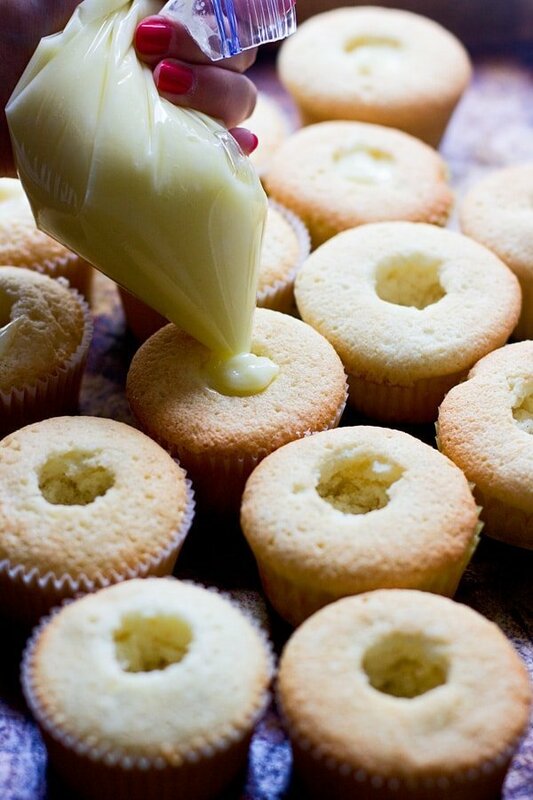 I like to chill them for ten minutes or so after making them, just to let the custard and “frosting” set, but if you’re making them a day in advance, just fill the cupcakes before, store them in an airtight container and then pipe them the day off. Make sure you let the cakes set out for ten minutes or so before serving so the cake warms up a bit. Just try to say no to these…. Light almond and vanilla flavored cupcakes stuffed with coconut custard and topping with a light as air whipped cream and mascarpone topping. Sift flour, baking powder and salt into a medium bowl. In the bottom of a stand mixer fit with the paddle attachment, beat butter and sugar on medium-high until smooth. Add in vanilla bean and almond extract. Beat until combined. Add egg yolks, bean until combined. Turn the mixer to low. Working in batches, add ⅓ of the flour mixture, followed by ⅓ of the milk. Repeat until combined completely. Scrap down the sides and bottom of the bowl, mix one more time to incorporate. In another bowl, using a hand held mixer, whip up egg whites until medium peas form. Fold mixture into batter, make sure to not deflate the egg whites. 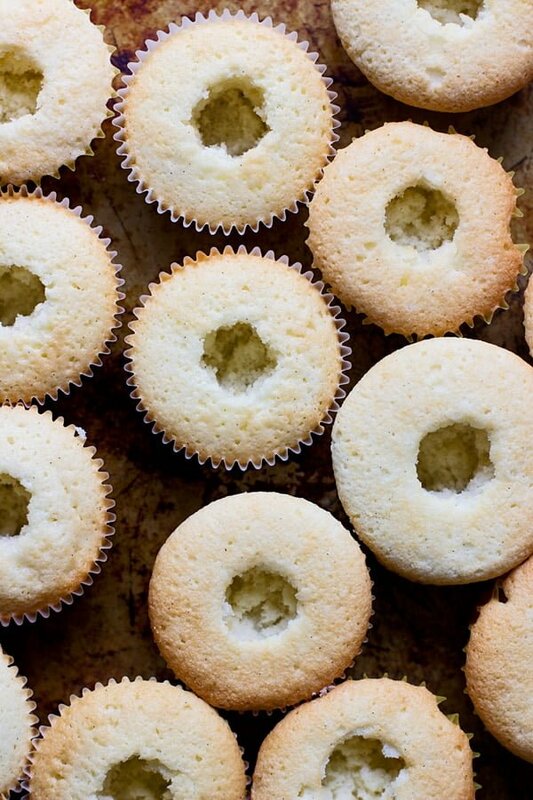 Fill muffin tins ¾ full. Bake for 23-25 minutes or until the edges are just slightly golden brown. Work in two batches. Let cool. In a medium sauce pan, whisk together coconut milk, sugar and egg yolk. Turn the heat on medium and using a wooden spoon, heat mixture until it is slightly thickened and the sugar has dissolved, about five minutes. In another small bowl, whisk together cornstarch and almond milk. Whisk into hot coconut milk mixture. Simmer until thickened, about five minutes. Once thickened, add coconut. Let cool completely. If you need to speed the process up, place in another bowl and chill in the freezer for 20 minutes or so. In a stand mixer fit with a whisk attachment add cold cream. Turn the mixer on medium high and whip until medium peaks form. Add mascarpone, whip until combined. Be sure to not over mix. With the mixer on low, add powdered sugar and mix just until combined. Transfer coconut custard to a ziplock baggie. Cut the tip off and pipe filling into center of cupcakes. 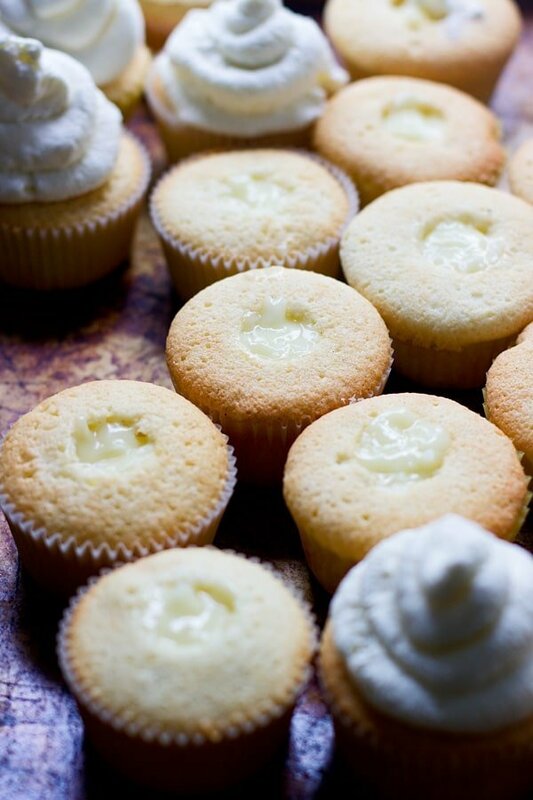 Transfer whipped cream to a large ziplock or pastry bag, cut the tip off and pipe whipped cream mixture onto cupcakes. 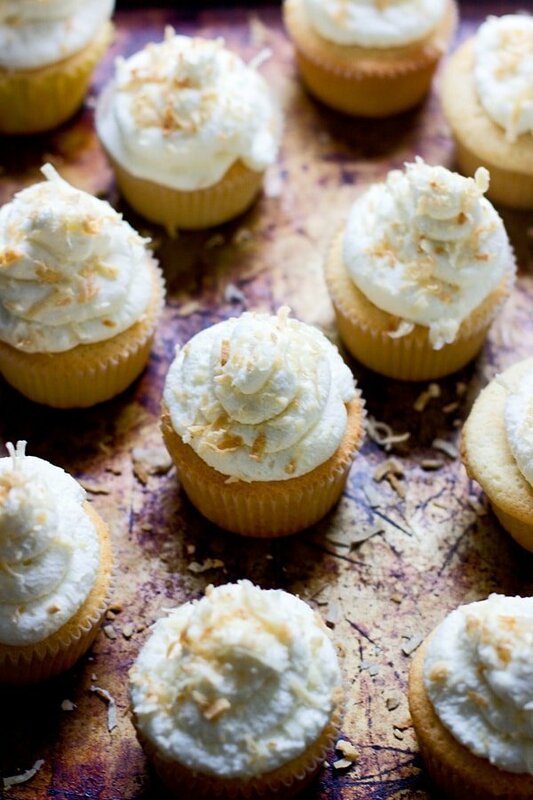 46 Responses to "Coconut Cream Pie Cupcakes"
Nicole, this cupcake is incredible! I’m swooning over the coconut custard filling, and I love the whipped cream and mascarpone frosting because it is not super sweet. Pinning. Definitely not super sweet, I can’t handle sticky sweet. Thanks Thao! Yes! You do! Thank Ilona! So gorgeous! Pinning to our coconut board. Let me know if you like to be a contributor to the board. Thanks Melanie! Sure I’d love to be contributor! These cupcakes look amazing! I love that you hollowed out the center to put extra icing inside. Yes please! I’ll take 2! More filling is always a good idea, right?! Thanks Kelley! Coconut cream pie is definately a nostalgic dessert for me as well! And one that can never (ever!) Lose its luster ♡ I adore that you transformed such a beloved classic into cupcakes! Sheer genius! These are perfection!! I think I just died and went to heaven! These look so amazing, Nicole! I much rather have one of these than coconut cream pie. These cupcakes look amazing Nicole! I love the coconut creamy goodness! Coconut cakes are my weakness. There is nothing better than coconut. 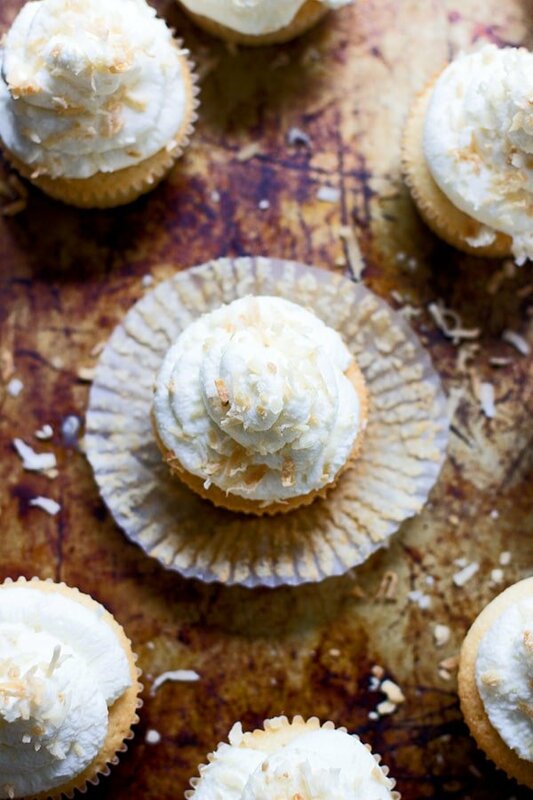 I can marry a coconut cupcake no matter how crazy it may sound. I was just thinking of making coconut cream pie, but got too lazy 🙂 I love the idea of a cupcake version! They look beautiful, Nicole! 1/2 (cup) shredded sweetened coconut in the custard? This makes 1 dozen? It seems like way too much batter. If you’re serving them within an hour or two, no, if not, yes. If you do make them ahead, just let them sit out for about 20 minutes before you serve. Just to clarify as I’ve never baked with actual vanilla beans…so I take the seeds out of the pod and then when it says to “add vanilla bean and almond extract” do I just throw the empty pod into the batter or does it need to be finely chopped or put through the food processor? Want to make these for my daughters 1st birthday in a few weeks! Sorry for the delay! I’m on maternity leave! Just add the seeds! Could I make the custard filling the day before and fill them the next day before serving?